I love it when my sketches inspire others to draw. I intentionally choose to share my drawings, sketches and sketchnotes on the web as a way of encouraging others in their own drawings, sketches and sketchnotes. On Monday, I learned that Amanda Kern, professor at Valencia Community College in Orlando Florida was inspired by my SXSW Sketchnotes. 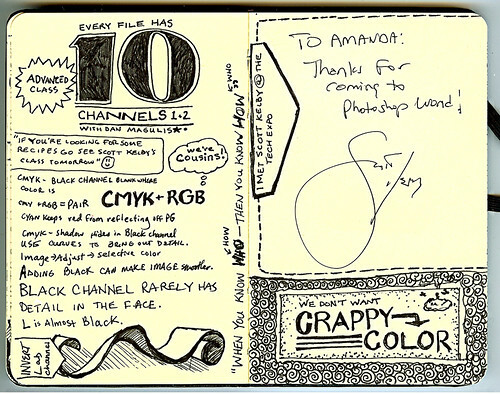 But she went a step further and encouraged her students capture sketchnotes while attending Photoshop World last week. Wow, that is so cool! If you happened to be at the conference you may have noticed many of us sketching away in our sketchbooks during classes. Several of us had attendees and speakers comment on how we took such great notes during the conference. With inspiration from Mike Rohde’s awesome sketchnotes, I proposed the idea of creating sketchnotes to students who were awarded Photoshop World Scholarships. They’re a great reflection of just how many great things were thrown our way during the conference. I’m quite impressed with how they turned out. Sketchnotes provided a creative way for us to document the experience. I love this! It's wonderful to see students exploring the idea of sketchnotes, finding out how to make something unique and interesting for others to see, but also rich and detailed for their own memories of the event. Amanda, thanks for trying sketchnotes, I'm honored to have inspired you guys! I too took part in the sketchnotes for PSW... I had a lot of fun and I truly think that this will help me to remember the information longer! Thanks for the inspiration! How cool is that? Congrats Mike! Wendy, great to hear you had fun doing your sketchnotes. I hope that works as a tool to help you capture ideas and think visually. Thanks Mike! Yes, seeing your sketchnotes brought back memories to many of us who recalled doodling in math class in high school. :o) I was glad to see how many students were anxious to participate. Though I must admit we did have some conference attendees stare at us wondering why were were taking such elaborate notes, especially when Scott Kelby and the gang at NAPP make sure attendees get a huge workbook with a space to take notes. What I love is that it's a quick place for us to refer back to and it not only documented some of the key things we learned but you'll see in many of our notes some of the hilarious things the speakers said during the conference. Well I have to say Mike, that after I saw your notes I went out and bought a new Moleskin and got to work.My first efforts are poor,but pratice makes perfect,so they say. Thank you for the inspiration. I also took part in the sketch notes and found it really helpful for remembering information that went on during PSW. Now I find myself sketching all of my notes now in class. It was fun! I was one of the sketchnote students. It was interesting, to say the least. Makes you think about taking notes in a completely different way. Amanda, thanks for trying out sketchnotes at this event! Looks like the students really got into it! Tim, great to hear you've gotten into sketchnotes during sermons. That's another great application for this style of note-taking, for sure. Jason & Joel, thanks for the comments. Great to hear you two had a good experience with the sketchnote idea, keep me posted on how they work for you in other instances.